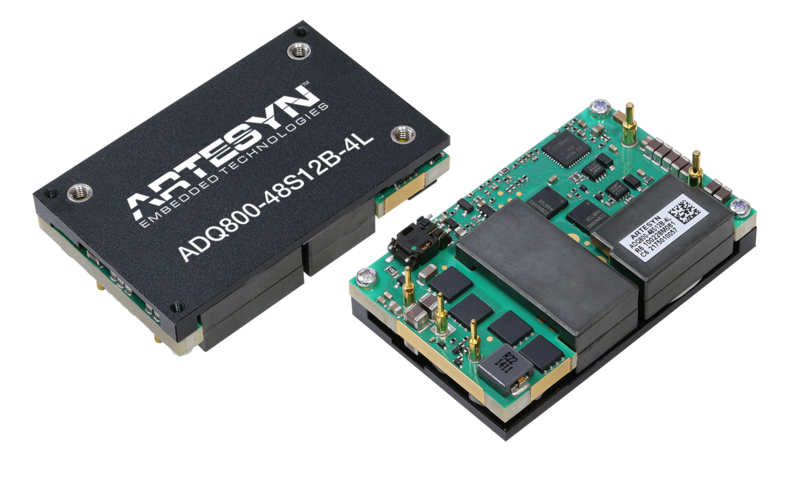 Tempe, Ariz. [7 November, 2017] — Artesyn Embedded Technologies today announced the ADQ800 series, a new 800 watt quarter-brick isolated dc-dc converter with the high efficiency and thermal performance demanded by telecom network and data center equipment. Capable of delivering up to 70 amps output current with a single fully regulated 11.8 V output, the converters have no minimum load requirement. The ADQ800 series has an input voltage range of 40 to 60 V and is primarily designed for use with standard 48 V supplies in computing and server applications, as well as regulated 48 V supplies in telecom equipment. An ultra-high efficiency of typically 96 percent at full load and the ability to operate over an ambient temperature range of minus 40 to 85 degrees Celsius, makes them an ideal choice for the isolated converter in a distributed power architecture supplying power to non-isolated converters. Their design is optimized for forced air or conduction cooling and an aluminum baseplate option is available for enhanced thermal performance. The conversion technology employs 175 kHz fixed frequency switching to help minimize external EMI filtering requirements. The converters are comprehensively protected against output overvoltage, output overcurrent and overtemperature conditions. ADQ800 series converters have an enhanced pre-bias start-up capability and, for high current applications, two converters can be connected in parallel, automatically using the droop method of current sharing and have an enable function to facilitate sequenced startup control of the unit. 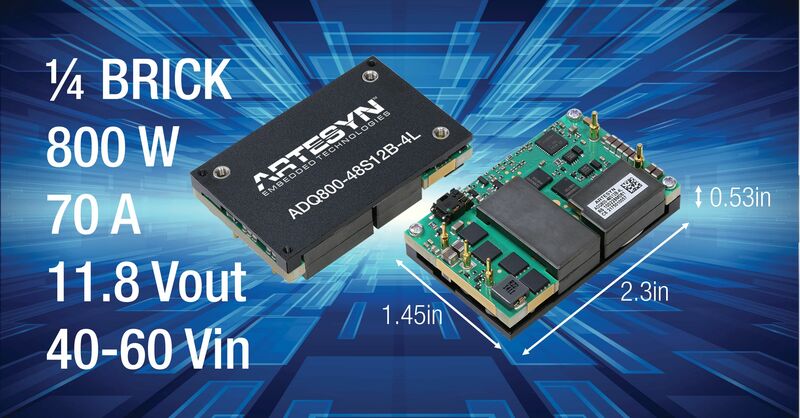 Artesyn ADQ800 series converters are low profile units that are ideal for systems with demanding inter-board spacing requirements; the baseplate models have an installed height of 0.53 inch (13.6 mm).